I’m kind of ashamed how much I love, LOVE, Drink, Slay, Love by Sarah Beth Durst. I think what I like most about it is that it’s not trying to be something it’s not. This is a fun read, and this novel isn’t trying to be more than that. I was completely engrossed in the story, I didn’t read the book, I flew threw the book. I needed to where this was all going. Pearl Sange, the main character in the story, well she just awesome. I mean sure, she is mostly evil but any good teenage vampire is. Pearl’s life is totally changed when she runs into a sparkly unicorn. Every vampire knows that unicorns don’t exist. Zombies, sure. Unicorns, no way. So when Pearl claims that a unicorn staked her, no one believes her. The side effects of the unicorn are many, including being able to walk in the sunlight. “Humans didn’t have to hang out in a chicken coop before having chicken nuggets. With this many humans, she bet it would even smell like a chicken coop. But she couldn’t explain to Mother and Daddy that she’d balked [her first day at a human high school] because of the stench.” But what better way to stalk your prey than in a high school, during the day? The first chapter can be found here. Enjoy! 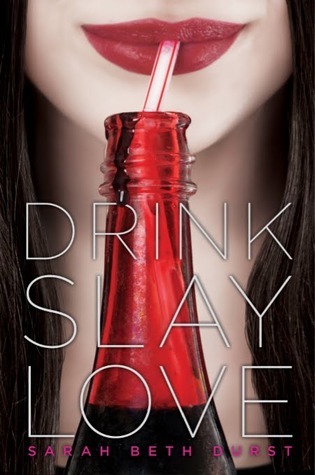 This entry was posted in Vampires, Young Adult and tagged Drink, Fun Read, Funny, Love, Sarah Beth Durst, Slay, Vampires, YA Book, Young Adult. Bookmark the permalink. I really, REALLY LOVE this book. I might have read it like 3 or 4 times. It’s super fast and super fun! I think you will like it too!